If you´re ready to start your Lessons you´ll want a driving instructor that will give you a best chance of passing your test 1st time. Top Gear Driving Academy have an excellent group of Qualified and experienced ADI instructors, who provide a high quality of training. All our lessons are tailored to suit the individual pupil, so you can be taught at a pace that best suit you. 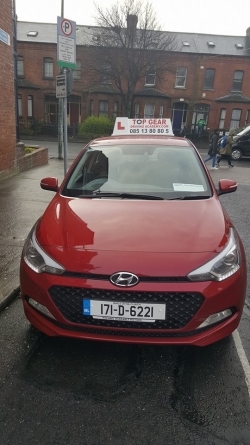 At Top Gear Driving Academy we teach with a calm and patient manner and because of this have a brilliant pass rate due to our commitment to our students. We also provide refresher courses to companies that want to enhance their drivers hazard perception and competence on the the road. Pick up from home work etc and drop you back . 1 hour pre test and car hire. All lessons are prepaid and are done in two hour sessions. This package is for the person who can´t get insurance or has no way of practicing. You get your 12 EDT lessons PLUS 10 practice lessons. You get a cert for a 20% discount on your First Insurance. This package is an up front payment. €290 for 12 So you get 10 lessons for €210 €21 per lesson. You won´t beat it.